Many consumers are faced with extreme debt. Some people who are facing debt are not able to file for bankruptcy. Quite often, consumers are sued by a collection agency for a debt they do not owe. Or the debt has already been paid. Or the debt is way beyond the statute of limitations. So there are a variety of reasons that a consumer may need to defend himself against a law suit to collect a debt. If you've been sued by a debt collector, there are specific steps you can employ for debt defense. What do you do if you don’t want to or simply can’t pay the debt? The very first thing you do is request a Federal Fair Debt Collection Practices Act debt VERIFICATION (FDCPA). This request buys you some time. All collection activity must cease until the attorney mails the verification to you. The verification is a simple statement signed by the creditor and it will not take the collection attorney long to obtain it. But for that brief period, nothing will happen. Also, sending the request for verification lets the collection attorney that you are not going to be a roll over debtor. He knows you will be active in the defense of the suit. A high percentage of collection suits proceed to default judgment without any response from the debtor. Requesting verification of the debt ensures that you will not immediately go to default. The FDCPA operates on the least sophisticated debtor standard so you don’t have to be fancy. Just make sure you do it in writing and I’d send it certified mail. Simply ask the attorney to verify the debt in accordance with the FDCPA. A verification request sent certified mail may end the collection process. When you are served with a civil summons initiating a law suit, you have 20 calendar days to answer. The count begins the day after you were served, and includes weekends, but excludes holidays. If day twenty falls on a Saturday, Sunday, or a holiday, the deadline is extended to the next business day. Create your answer in the same format as the complaint. The information at the top of the first page -- the circuit number, the county, the defendant, the plaintiff, and the case number -- are all identical on your answer as they appear on the complaint. Then make a title for your answer that follows the title of the complaint. "Answer to Complaint" works fine. Answer the complaint, paragraph by paragraph. Each paragraph is numbered to correspond to the numbered paragraph on the complaint. You can answer - affirm, deny, or the defendant has no knowledge and therefore denies. After your numbered paragraphs create a signature block with a line for your signature, your address, and your telephone number. At the very end you need to add the certification. This is the short paragraph that states that you have mailed a copy of the document to the other side; identifies the collection attorney by name or law firm; includes their address; and then leave a blank line so that you can hand write in the date you mail it to the collection attorney. Then create a second signature line so that you can sign it again. The next step is to file a SWORN DENIAL. This needs to be a written statement; notarized, and filed with the clerk of court. A copy needs to be sent to the collection attorney. It needs to be a graduated denial. It needs to say something like: I deny this is my debt and if it is my debt, I deny that it is a valid debt and if it is a valid debt, I deny the amount sued for is the correct amount. When a sworn denial is filed, the debt collection attorney cannot rely upon a sworn affidavit of account. Once the sworn denial is filed the collection attorney must produce a live witness to testify about the debt. The collection attorney may give up and go home, if you put too many hurdles like this in his path. Your next step is to file DISCOVERY which is a written Request for Production of Documents; Request for Admissions; and/or Interrogatories. Ask for a copy of the contract or agreement upon which the debt is based. If the debt is a credit card debt, it is possible that the debt collection attorney will not be able to produce a copy of the original agreement. Many credit card signature agreements are scanned or if older, microfilmed and stored away in electronic archives. If it is an old debt which has been sold to one or more collection agencies over the years, the possibility of producing the original signed agreement decreases significantly. The rules of court for small claims do not necessarily include the discovery process; however the rules do not specifically exclude discovery either. The Plaintiff has the burden of proving his case, so if there is no proof, the Plaintiff may not have any case at all, and the case might be dismissed. Most courts require mediation prior to the court hearing itself. The mediation may be on the same day as the hearing, immediately before your court time. In some courts, the parties appear for the hearing and then are asked if they want to attempt to mediate their dispute. Mediation is always worth a try, and there is nothing to lose. You may be able to come up with a workable plan to pay off the debt. Or you may be able to show the collection attorney that you have a very strong defense, and he'll drop it. If you come to an impasse at mediation, you can elect to go to hearing. If you come to an agreement, usually a stipulated settlement will be reached which spells out your specific agreement. The vast majority of debt collection suits proceed to default judgment because no one shows up to dispute them. Show up and ask for a trial. The worst thing that can happen is the same thing that would have happened if you hadn’t appeared at all, a judgment. You can’t make it worse. The best defense is the Statute of Limitations. The Statute of Limitations is the time limit that an aggrieved party has in which to file a lawsuit. It is a drop dead deadline. 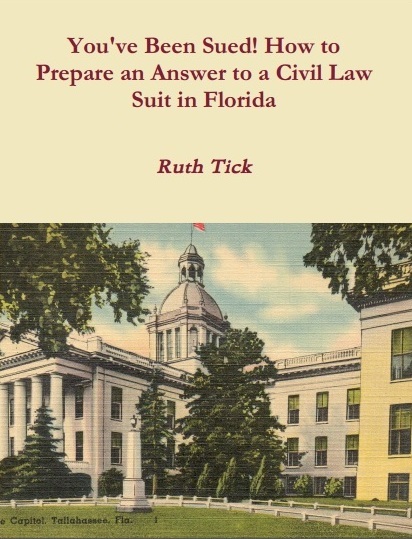 This book includes the basic procedural rules, formats for pleadings, and other information that may help you defend yourself in court - pro se.